Submitted by Cletus Waldman (not verified) on June 7, 2006 - 2:43pm. Ah yes... I had so much trouble when younger with electric razors pulling and ingrowns that I switched to a mug/soap/badger brush and a Mach 3. I have not noticed much in the way of different soaps. I tend to use either Caswell Massey or Col. Conk Almond as I like the scent. From my readings on this topic it appears you want to avoid anything that will close the pores.If it burns it is not good. I shave at the sink. Hot tap water. Then close the plunger, put the brush in while I am soaking the wash cloth. heat the face really well. 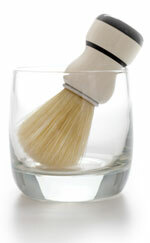 Pull the brush, shake 90% of the water out, lather in the mug and apply to the face. Too much water on the brush or too little and the lathering is not correct. Shave WITH beard growth, (always a disputed topic) and simply clean with with the hot wash cloth again. When I have gone against beard growth, I was back and ingrowns and was told to go with growth. You want to shave not undercut or pull them out. I don't pre-treat or post treat. But my face has not suffered the results experienced with electric razors.